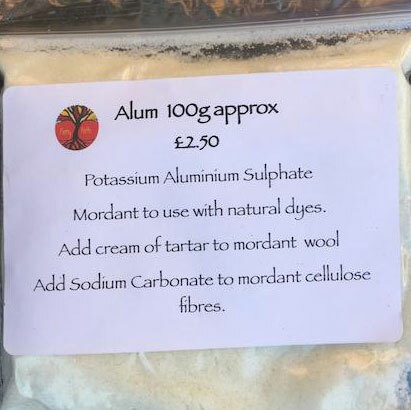 Alum ,potassium aluminium sulphate, is one of a group of chemicals known as a mordant. . A mordant acts like a bridge between fibre and dye and fixes the dye to the fibre. It deepens and enriches the colours for most dyes and improves light and washfastness. Alum is the safest mordant to use, a used mordant bath it can be disposed of down the sink but it is recommended to wear gloves to protect your hands when putting your hands in a mordant bat. A standard recipe for wool and silk is 10% of the Weight of Fibres (WoF) in Alum and 8% WoF Cream of Tartar, which acts as an assistant. For cotton and other cellulose fibres Alum is part of a two or three day process combined with washing soda. For more information on how to use Alum read my book Colours of the Earth Natural Dye recipes now available as digital download.